After the measures passed, a few Legislators responded to the public with comments of their own. According to the Court’s ruling, “Municipalities have a unique authority and responsibility in the regulatory framework which must be maintained; they ‘give consideration to the character of the municipality, the needs of the citizens and the suitabilities and special nature of particular parts of the municipality.’” In the end, the court’s decision permits a local regulatory body to enact “traditional zoning regulations that identify which uses are permitted in different areas of the locality, even if such regulations preclude oil and gas drilling in certain zones….” However, the decision also restricted the scope of local jurisdiction, “We do not, for instance, suggest that the municipality could permit drilling in a particular district but then make that permission subject to conditions addressed to features of well operations regulated by the [Pennsylvania Oil and Gas] Act.” (Bold added for emphasis.) Essentially, when it comes to actual drilling practices and operations, the Court upheld that Pennsylvania State law will carry more force than local regulations. In Sullivan, as well as in other New York State towns and counties, legislators should harness the public’s growing outrage that local control of community resources is being stymied by Albany and Washington. 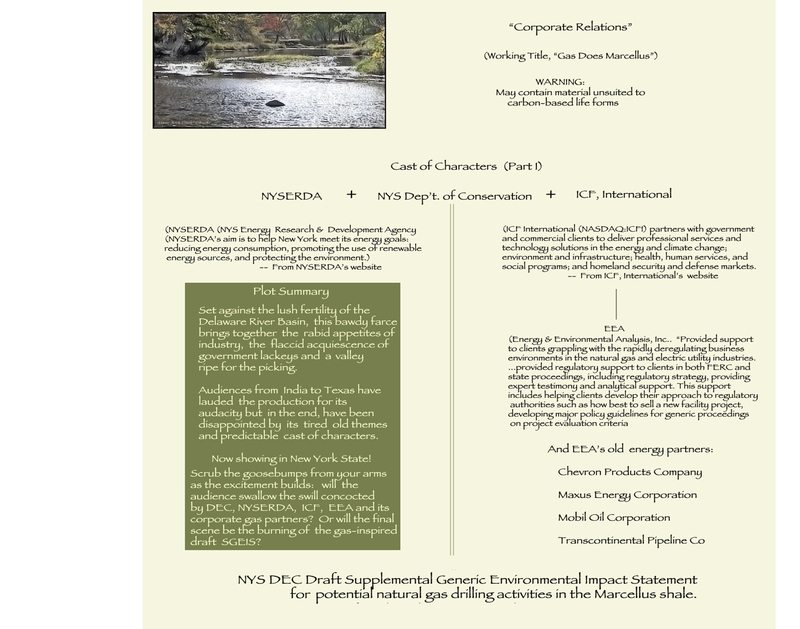 To read Breathing’s review of the sometimes-bawdy, always entertaining, “Corporate Relations: Gas Does Marcellus” please click here. The choice is yours: pay the admission price for a tired old movie with a cast of raggedy characters (be prepared to swallow long and hard) OR pop on over to “Ban Natural Gas Drilling In New York State” and sign the petition.